A question I receive once in a while is what application I use to write my blog posts. Most people believe I must be using Microsoft Word or Google Docs but this couldn’t be further from the truth. When writing a blog post, I want a simple clean work environment with the fewest number of distractions possible. Additionally I want a tool where I can prepare my entire post and then copy and paste it into my CMS. Since my host supports the markdown layout language, this too became very important for me. So what do I use to write my blog posts? 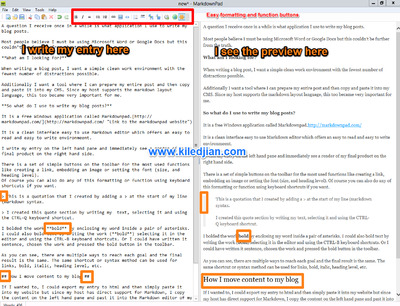 It is a clean interface easy to use Markdown editor which offers an easy to read and easy to write environmeent. I write my entry on the left hand pane and immediately see a render of my final product on the right hand side. There is a set of simple buttons on the toolbar for the most used functions like creating a link, embedding an image or setting the font (size, and heading level). Of course you can also do any of this formatting or function using keyboard shortcuts if you want. This is a quotation that I created by adding a > at the start of my line (markdown syntax. I created this quote section by writing my text, selecting it and using the CTRL-Q keyboard shortcut. I bolded the work bold by enclosing my word inside a pair of asterisks. I could also bold text by writing the work (bold) selecting it in the editor and using the CTRL-B keyboard shortcuts. Or I could have written it sentence, chosen the work and pressed the bold button in the toolbar. As you can see, there are multiple ways to reach each goal and the final result is the same. The same shortcut or syntax method can be used for links, bold, italic, heading level, etc. If I wanted to, I could export my entry to html and then simply paste it into my website but since my host has direct support for Markdown, I copy the content on the left hand pane and past it into the Markdown editor of my sites CMS. I love the tool and it has saved me countless hours of writing, copying and then formatting. If you have a blog that support Markdown, download and use this cool app.